According to private and public estimates, billions of dollars are lost per hour to healthcare waste, fraud, and abuse. 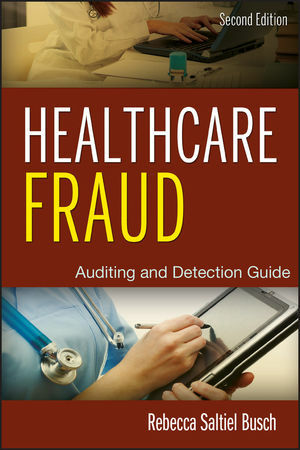 A must-have reference for auditors, fraud investigators, and healthcare managers, Healthcare Fraud, Second Edition provides tips and techniques to help you spot—and prevent—the "red flags" of fraudulent activity within your organization. Eminently readable, it is your "go-to" resource, equipping you with the necessary skills to look for and deal with potential fraudulent situations. Managing the risks in healthcare fraud requires an understanding of how the healthcare system works and where the key risk areas are. With health records now all being converted to electronic form, the key risk areas and audit process are changing. Read Healthcare Fraud, Second Edition and get the valuable guidance you need to help combat this critical problem. REBECCA SALTIEL BUSCH, RN, MBA, CCM, CFE, CHS-III, CPC, FHFMA, FIALCP, has a passion to create educated, conscientious healthcare consumers. Recent leadership and professional recognitions include the 2011 Chicago United's Business Leaders of Color Award, 2010 Finalist for the Enterprising Women of the Year Award, and 2009 Recipient of the Influential Women in Business Award by the Business Ledger in partnership with NAWBO. Her entrepreneurial, professional, driven career has resulted in various proprietary audit platforms in multi-market verticals in healthcare, and authorship of over 200 articles, books, and presentations to consumers, government, corporate, and professional entities. Recognized as an expert in her field, she has provided public and forensic expert testimony and participated in public policy discussions and the development of best practice standards. Rebecca currently has seven U.S. design patents and one U.S patent focused on efficacy, risk, FWB, and revenue management within healthcare.